No Multichannel during trial period? I am testing a trial version of Roon on above hardware connected via Hdmi to my Classé Sima SSP 7.1 Multichannel preamp. But I don‘t get any multichannel into the preamp, only stereo whether I try to stream 5.1 Flac content from the local NAS nor from Qobuz. In the “Device Setup” screen, accessible from Settings-Audio I don’t have the dropdown for channel layout available. Is multichannel limited to paid version? the trial is a full version. It is a limitation, afaik, in the Sigma SSP. I see nowhere is there any mention of multichannel using network or USB connections. 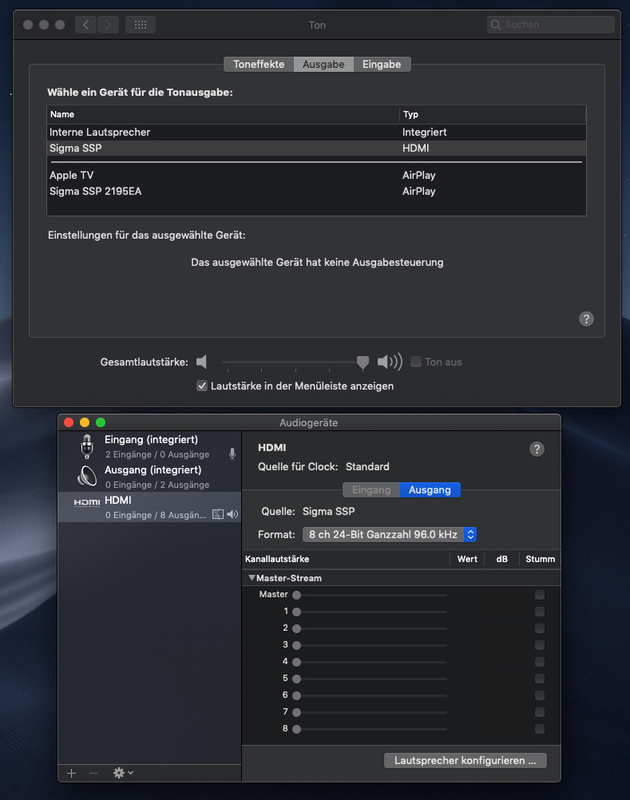 In my experience, Macs can have trouble detecting HDMI devices (even when using Audio MIDI). I actually recently migrated all my music off a Mac onto a Windows 10 laptop because the Mac would randomly fail to detect the AVR it was connected to over HDMI, thus disallowing 5.1 playback. Perhaps you could download a 5.1 track onto the Mac’s SSD to see if Mac --> HDMI --> Classe will give you multichannel? (Thus testing the possibility that it’s an issue related to streaming from your NAS/Qobuz)? 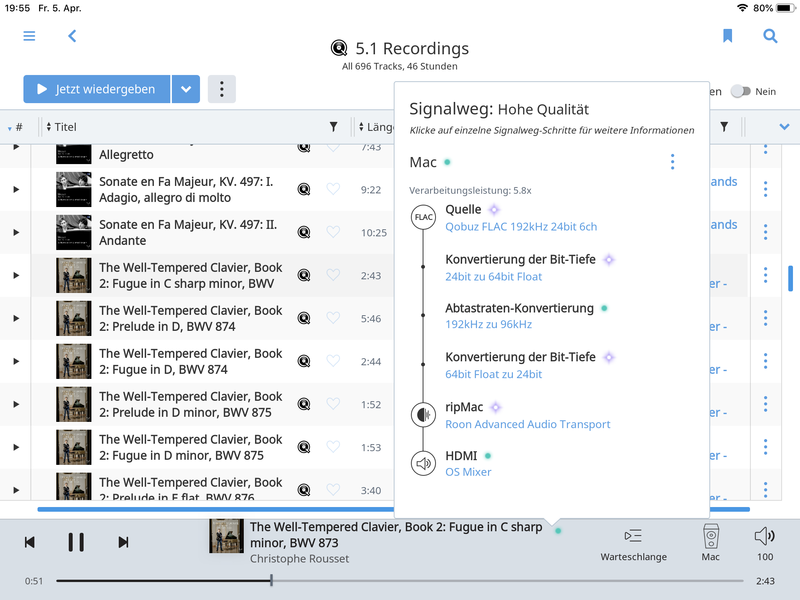 Oh, one more thing – AFAIK, Qobuz will not stream its 5.1 content in multichannel, only in 2 channel. At least, I haven’t been able to stream it in 5.1. I belive the 5.1 content can only be downloaded after purchase. Not so. They have very little multichannel but Qobuz can stream what little they have just fine. The limiting factor is the SSP. Hmm, thanks for that info. 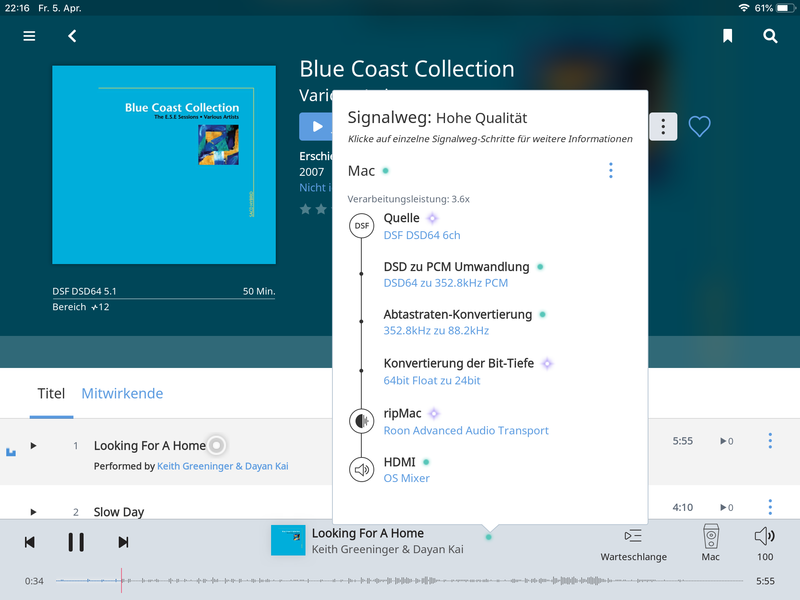 Would you be willing to share the audio path you use to get Qobuz 5.1 playback…? Its not magic. All you need is a multichannel-capable endpoint that is recognized by Roon. I’ve used an exaSound e38, a trio of Benchmark DACs via a miniDSP U-DIO8 and a Trinnov Altitude32. Other stuff, too. Stefan, I can now confirm that I have been able to get Qobuz to play multichannel, thanks to mitr’s correction. Roon Core on Windows 10 PC (with Qobuz) —> HDMI —> AVR. Thanks for contacting us regarding this issue. As others have mentioned, I do not see any multi-channel input sources listed for your DAC, as far as I can tell from the manual this DAC only does multi-channel output but does not list any multi-channel inputs. With this test in mind, we can separate weather this is a Roon-specific issue or if this is due to the DAC itself. Please do let us know your results. This is a very common complaint: The vast majority of consumer multichannel AVRs and prepros will not accept multichannel input via streaming or USB despite the ease with which it could be implemented. They will only accept multichannel digital input via HDMI. I have heard that some Sonys can accept multichannel streaming input (which I cannot confirm) but I have had success with the Trinnov Altitude32. This is not a Roon issue. Finally I achieved to stream multichannel tracks over HDMI with my Classe Sigma SSP with your kind help. Thanks for all your appreciated replies. As otinkyad said: configuring via the Audio MIDI Setup utility on the Mac helped, rather than just using Sound Settings. After that I could stream a 5.1 track stored on the Mac via QuickTime. Also multichannel streaming with my Roon setup on the Mac worked fine then, including multichannel streaming from Qobuz! It looks like as if the output over hdmi on osx is limited to 96 kHz, so higher sampled files will be converted down by Roon. I will check if this limitation also remains when using a windows pc. As Kam mentioned It looks like as if the Sigma SSP does not support multichannel streaming over usb or network. I will have confirmed this from the Classe support and ask if they plan having their preamp/processors Roon ready. Glad to hear that you have been able to stream multichannel over HDMI by using the Audio MIDI setup tool! The Sigma SSP manual unfortunately does not contain information about the max sample rate supported via HDMI so your best course of action here would be to contact them directly regarding this info. I am also curious to see weather there is any change to this limitation if using Windows. Have you also checked the Sigma SSP Menu by any chance? I wonder if there could be a setting on the menu that allows you to change the maximum sample rate via HDMI. Yup. Much as it ever was. Thanks for letting us know those limitations. It seems like the only remaining piece of this puzzle is asking Classe support if they plan on becoming Roon Ready, but everything else looks like it’s working. Was there anything else you needed assistance with before I mark this thread as [Solved]?